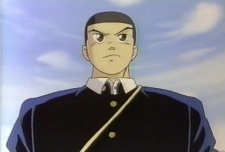 The main character and narrator for much of the first volumes (that make up the less serious portion of the series). He is a 2nd year student at Kangokou High School and a walking target for beatings at the hands of the school's numerous youth gangs. He is rarely seen without his close friend Saitou at his side. His growing frustration at being the gang members' punching bag leads him to join Kangokou's "Karate Club", a fighting school for Osaka's toughest delinquents, gang members, and other unsavory teenagers that covers as a typical school sports club. At first he is picked on and harassed even worse by the club's members, but gradually learns a great deal about fighting and standing up for himself from his time with the club. In spite of his newfound confidence and abilities, he still has absolutely no luck with girls, as they tend get frightened off or quickly lose interest when he mentions which school club he belongs to. As the series goes on it shifts the focus off Matsushida and he becomes more of a supporting character.